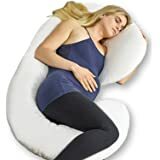 Marine Moon C-Shaped Full Body Pregnancy/Maternity Pillow with Washable Cotton Cover, 59"
Betty Dain's Stretch Jersey Knit Pregnancy & Maternity Pillowcase features soft, 100 percent cotton fabric for the ultimate in comfort and quality. Dual zipper closures make changing and washing your pillowcase a breeze. 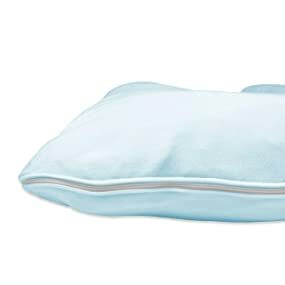 This pillowcase fits most maternity pillows including the Snoogle and is machine washable. Note: Pillow not included; not a Snoogle OEM product. Designed and manufactured by Betty Dain, which has listened to the needs of the beauty industry and created high-quality solutions for over 60 years. 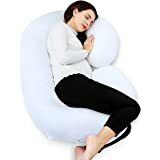 Cover your maternity or pregnancy pillow with this incredibly soft, 100% jersey knit cotton pillowcase for a peaceful, comfortable rest. 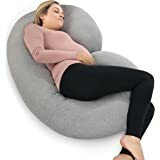 Betty Dain's pillow covers are specifically designed to be compatible with the most popular maternity pillows on the market and come in multiple shapes so you can cozy up to the contour that works for you. Treat yourself, you deserve it! 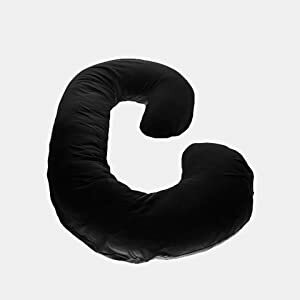 This Snoogle-compatible cover adds a new layer of soft warmth to the popular C-shaped maternity pillow design. 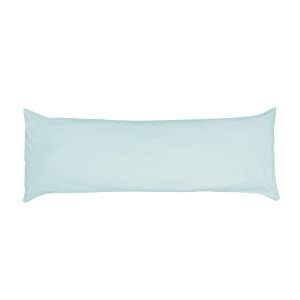 Perfect for Back 'N Body styles, this pillowcase offers soft comfort front and back. A comfortable bolster style that first 21"x54" pillows. All of Betty Dain's standard and maternity pillowcases are made in the USA. Betty Dain's maternity pillowcases are designed for comfort, convenience, and versatility so you can add an extra layer of softness to your favorite maternity pillow. 5.0 out of 5 starsGet Ready To Share Your Bed. Again. This pillow cover is just what I needed! So soft! 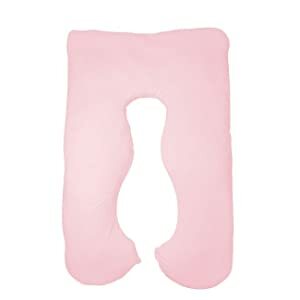 I purchased the snoogle pillow and found it a bit scratchy and hot to sleep with my face on. So I started by putting a regular pillowcase on the side I put my face on when I sleep but it always fell off and also looked really bad on my bed. This pillow cover is made of a fabric that is a little stretchy and that plus the dual zippers make it WAY easier to put on my snoogle pillow. The fabric is also super comfy to sleep on! Great product, great price. I'm going to buy one as a gift for my friend who is having her first baby too! I was thoroughly disappointed by the amount of time it took these to ship to us (2 months wait time was a bit ridiculous), but after receiving it I am happy with the pillowcase overall. It is slightly long, but after searching everywhere for one of these, I'm happy it is here. It functions as to be expected and is comfortable to use. 5.0 out of 5 starsEasy to use!! Fits great!! Goes on much easier than the cover that came with my pillow, which is a HUGE plus for me!! Great price considering the name brand pillow cases go for nearly double!! I’ve only washed it once so far but seems pretty durable. A TINY bit itchy on my face but otherwise quite comfortable. (I’m also pretty sensitive to fabric being itchy so if you aren’t then you may find it just fine!!) Overall I def recommend! !